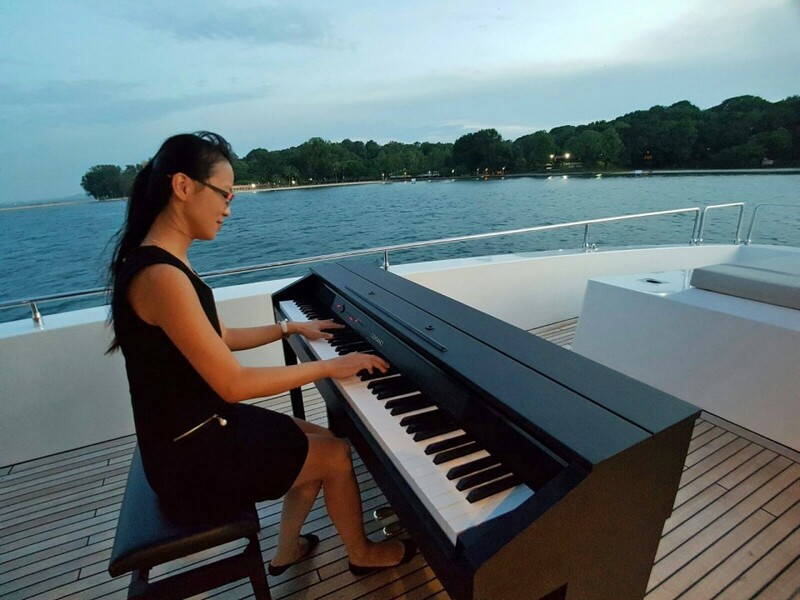 Call 8792 3477 to book a yacht with pianos on board for your private events, celebrations, anniversaries, and weddings today! 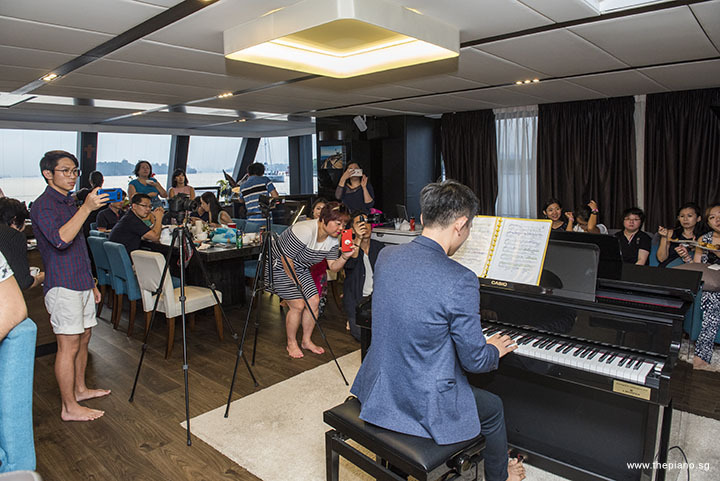 Customise your needs: Pianist(s), Photographer, Videographer, Drone Pilot, Buffet Catering, and Fireworks. 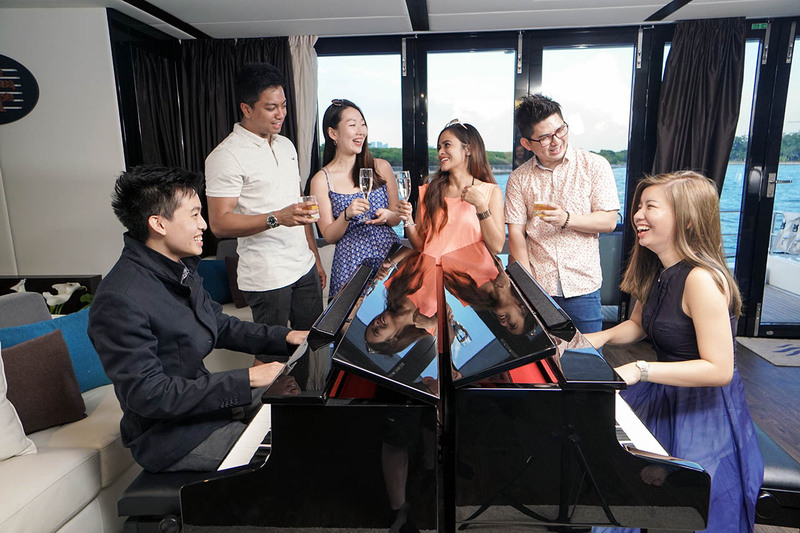 Set sail on the southern seas with Pianovers as you titillate your senses with the melody of musical notes. 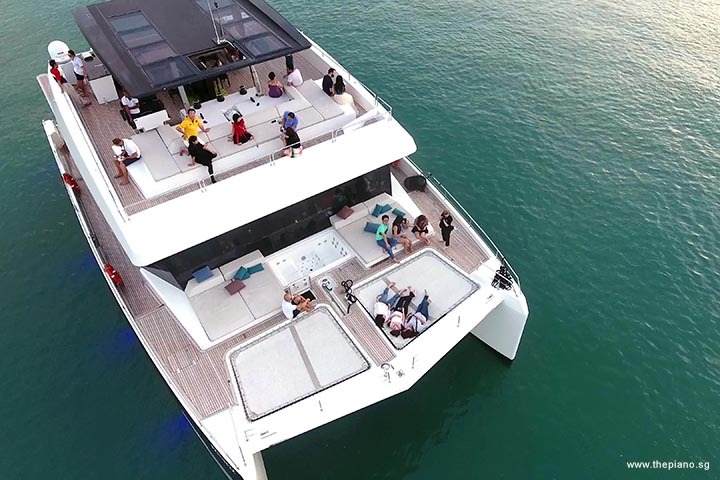 Relish every moment on the open deck of the luxurious, 68-foot long yacht. 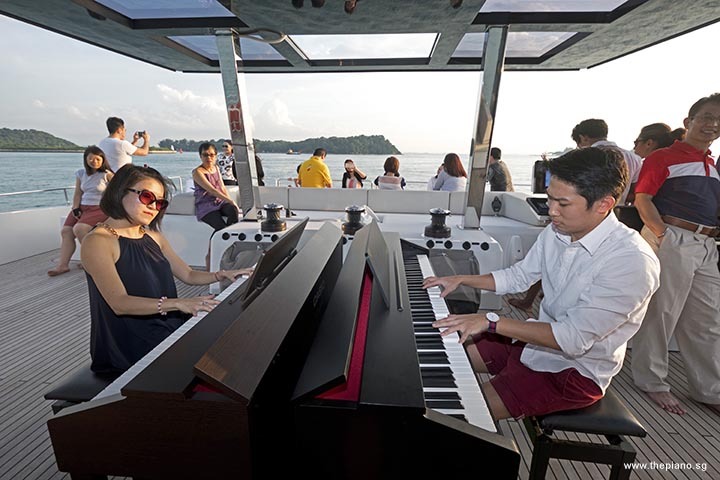 As the balsamic yet invigorating sea breeze caresses the lapping waves, listen to famous piano compositions played by Pianovers, before indulging yourself with your favourite pieces on the pianos. 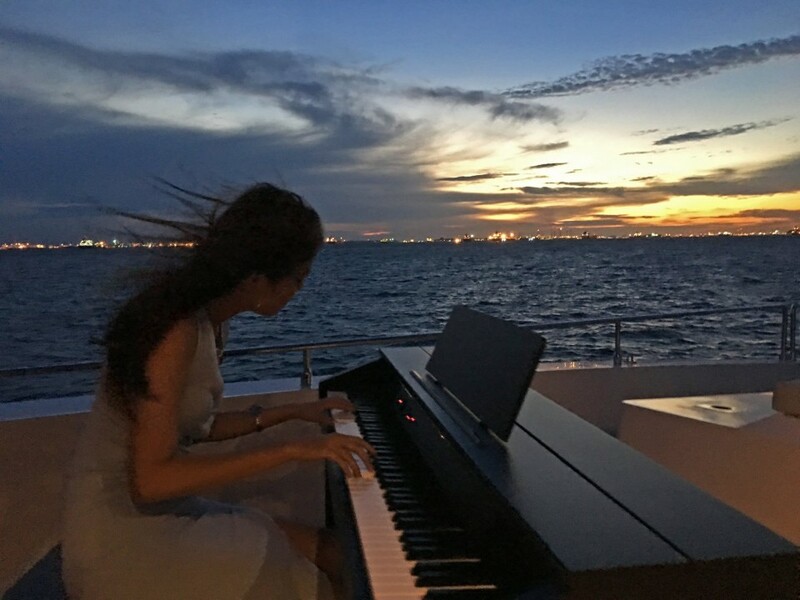 Admire the golden glow of the distant sun as it starts its descent into the horizon, painting a warm picture of serenity on the yacht. 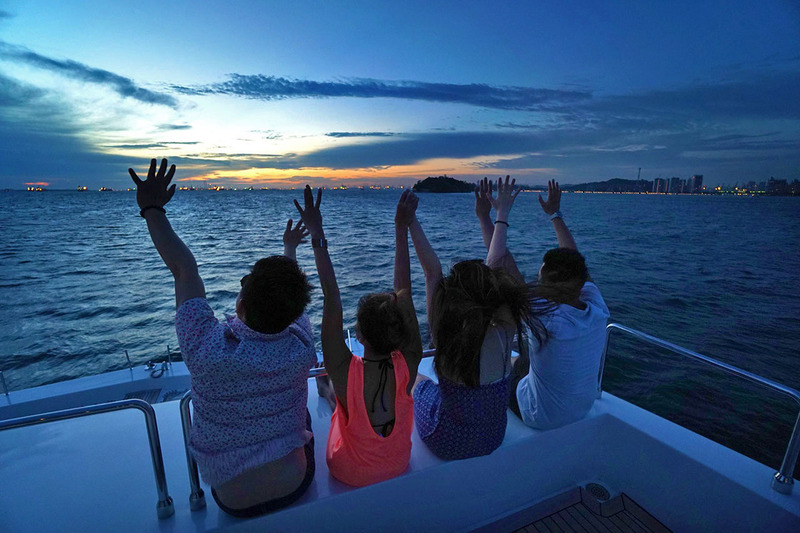 Looking out from the flybridge at twilight, while taking in the sights and smells of the open sea, makes for a truly magical moment. 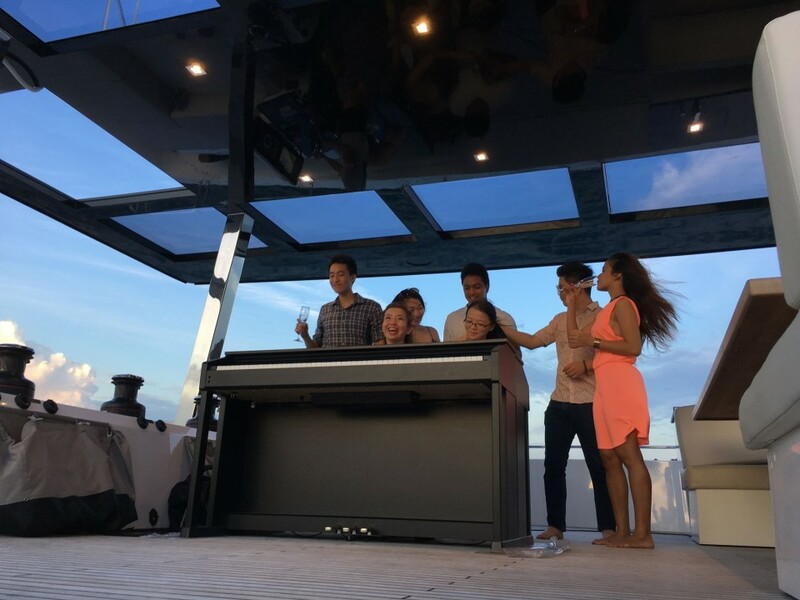 This is an undoubtedly unique experience, exclusively for you. 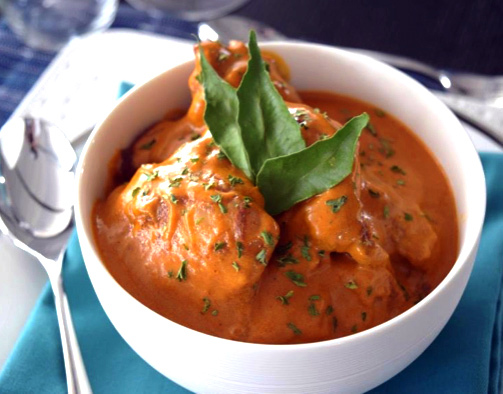 Awaken your culinary senses with the delectable buffet spread on offer. 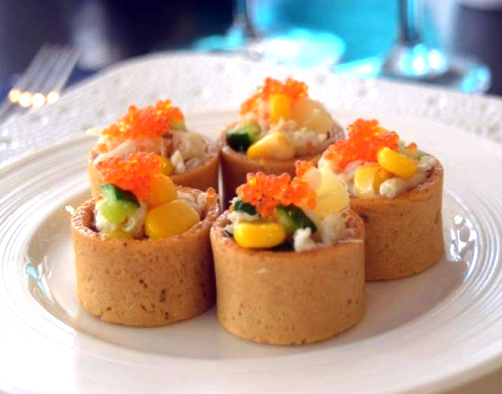 With a seven-course dinner worthy of the classiest restaurants to satisfy the most discerning palate, there is definitely something for everyone. 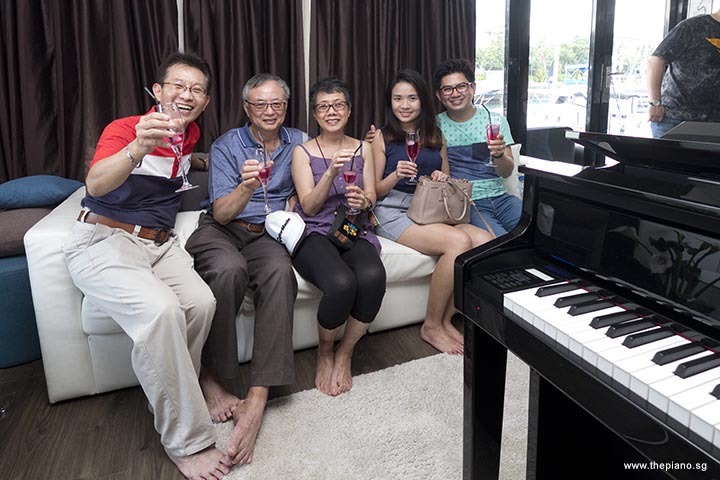 Savour a glass of champagne and share a musical tip or two with fellow Pianovers. 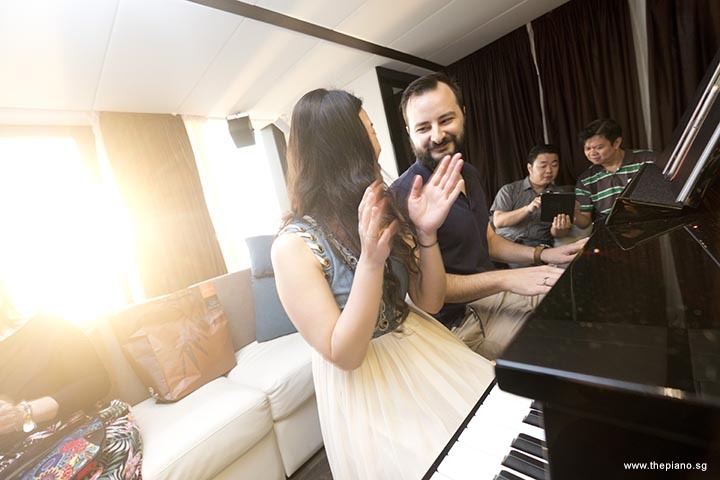 Enjoy a free flow of exceptional, award-winning wines from the pristine Great Southern wine region of Australia at an additional cost of S$30 per person. 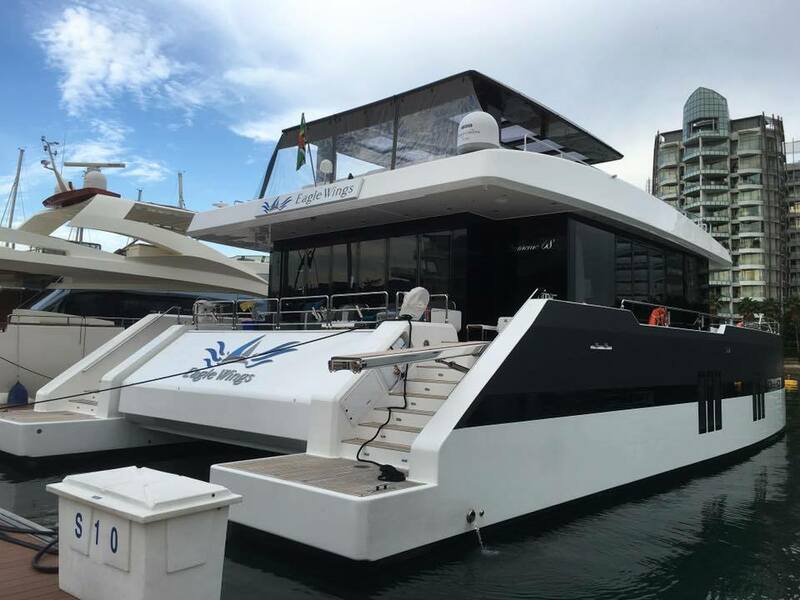 There is no better place for wine indulgence than aboard a beautiful catamaran and against a dazzling backdrop of fireworks! Realise your dream of performing on a yacht today! 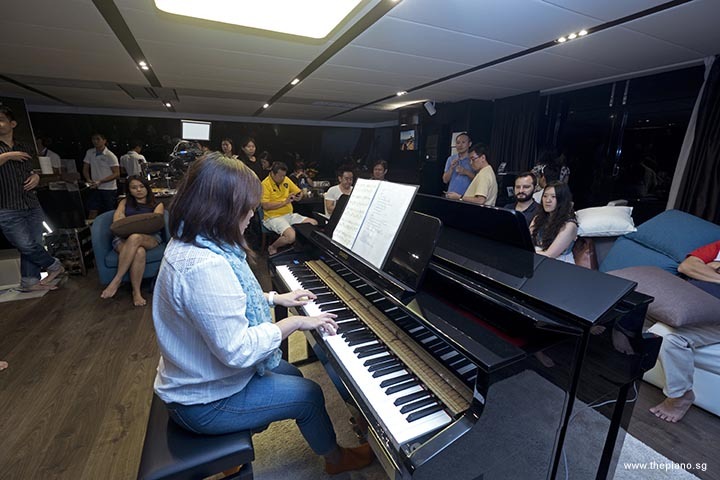 There has never been a more perfect setting to showcase your musical talent and amaze the impressionable audience. 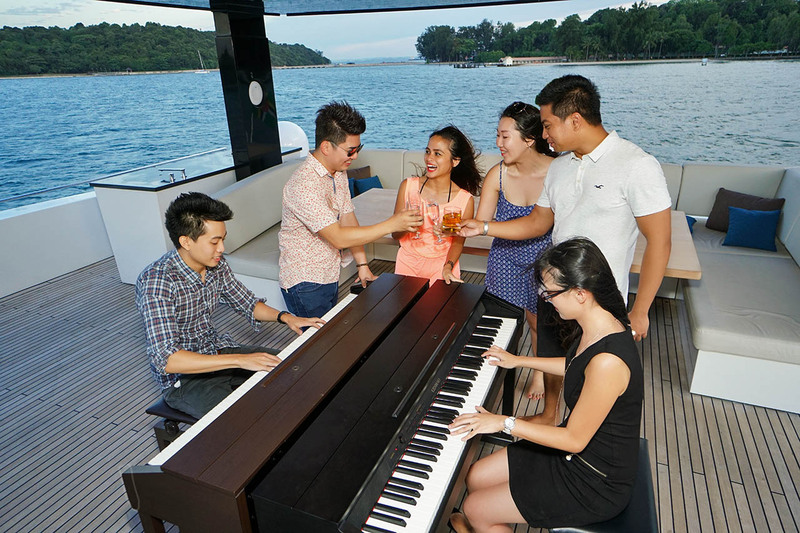 Bring your family and friends on an unforgettable musical serenade. 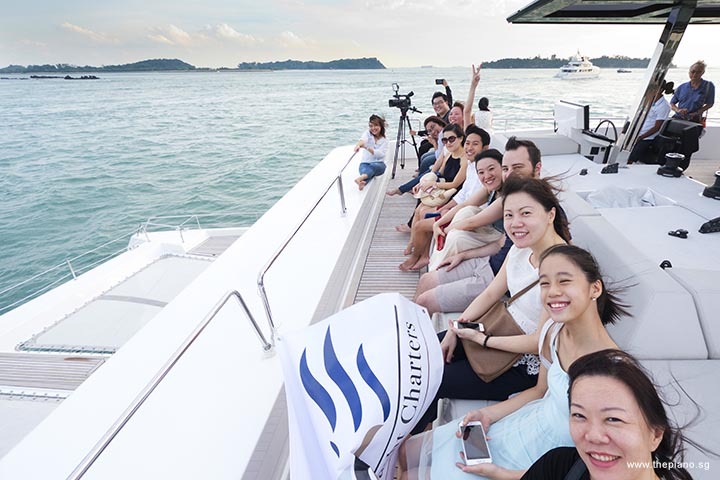 Pre-book your slot and await the grand day! 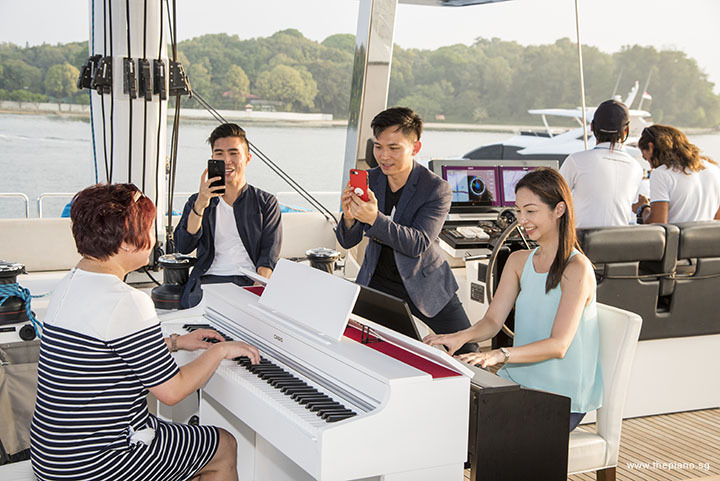 Put on your best smiles as our roving Photographer will capture your perfect moments, and send them to our Photo Booth on board for instant printing. Collect your unlimited 4R print-outs and remember these magical moments forever. 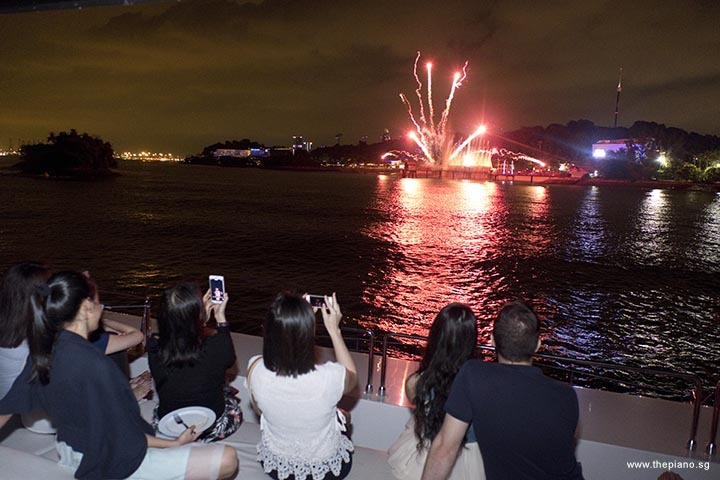 Get ready for a visual treat as the idyllic setting unexpectedly gives way to the euphoria of dazzling fireworks. 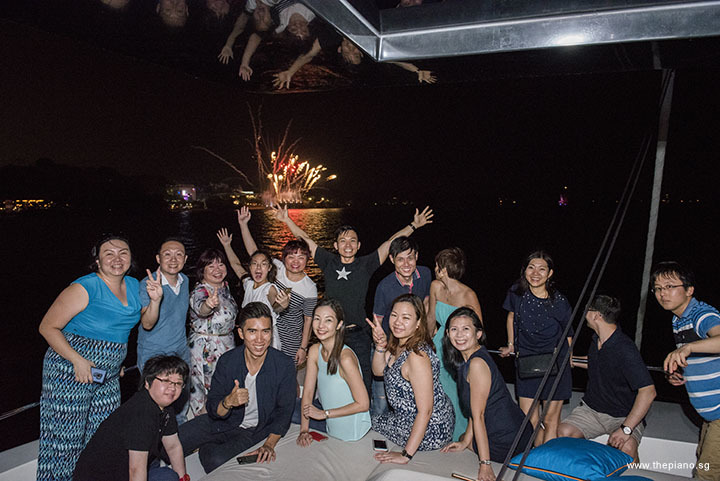 Illuminating the night sky over Sentosa is the immensely spectacular show of colour, splashing the still black canvas with bursts of multicoloured hues. 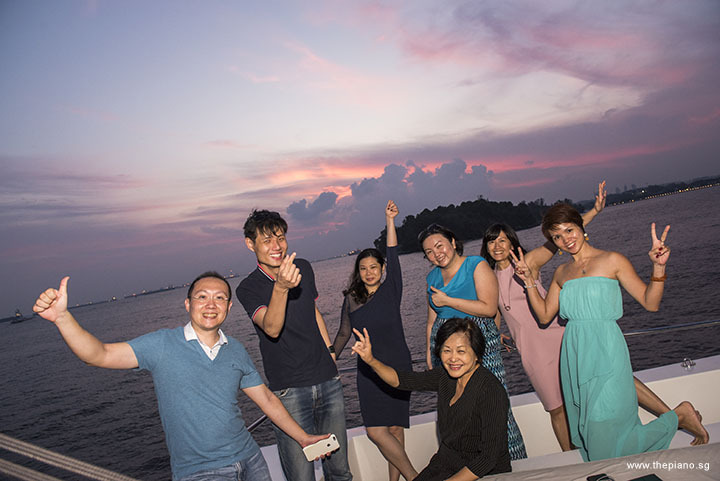 Capture the memorable scenes for posterity or simply enjoy the moments quietly with your loved ones. 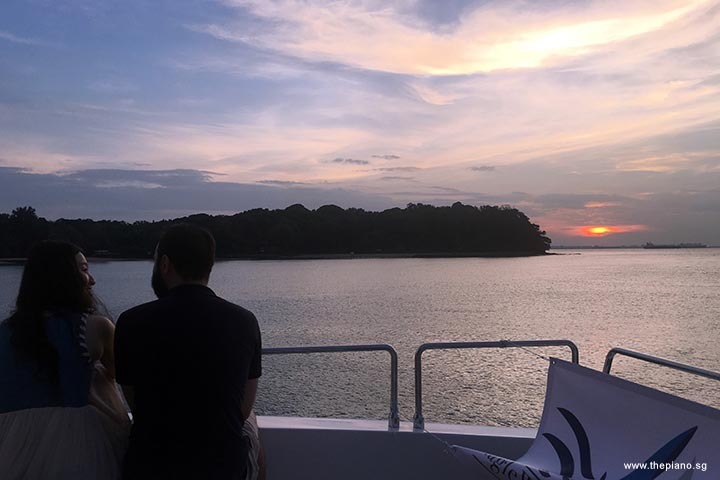 4pm Arrival at Sentosa Cove, One°15. 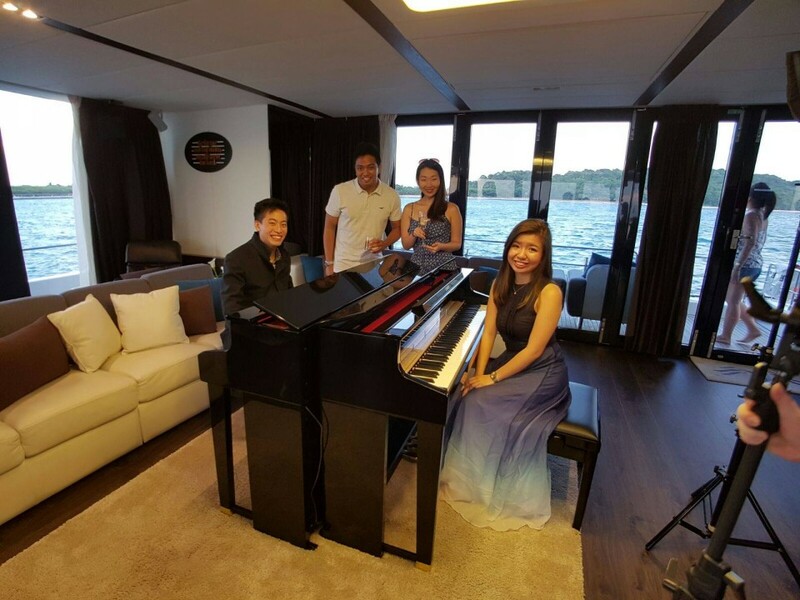 Take a pre-boarding picture with pianos placed in front of the yacht. 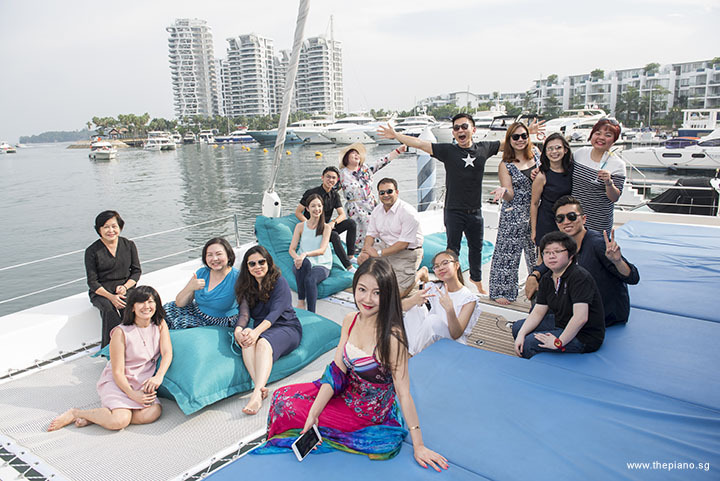 Take pictures, socialise and enjoy! 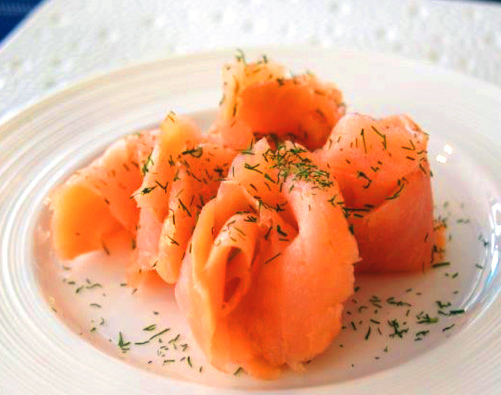 Buffet dinner is served throughout the sailing. 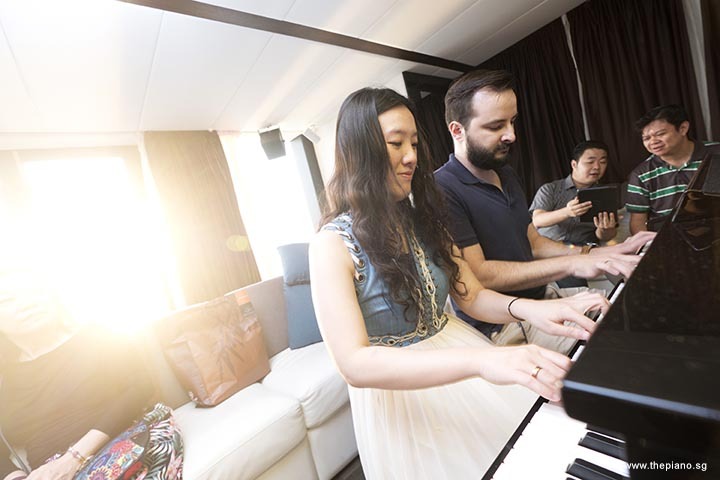 5:30pm An hour of mini-recital. 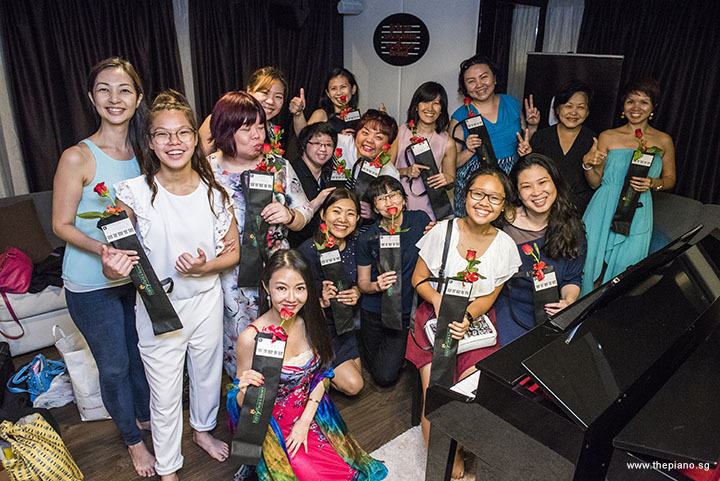 Indicate your interest to perform during this recital when you buy the tickets. 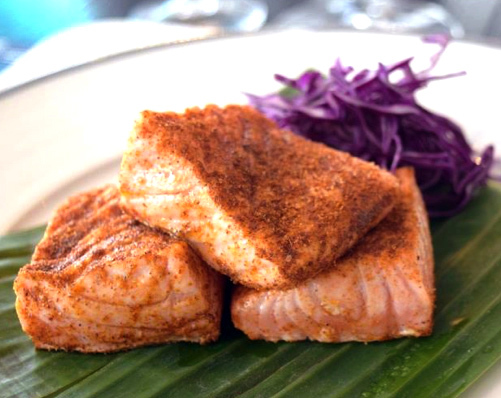 It's on a first-come-first-serve basis, and you're given about 5min. 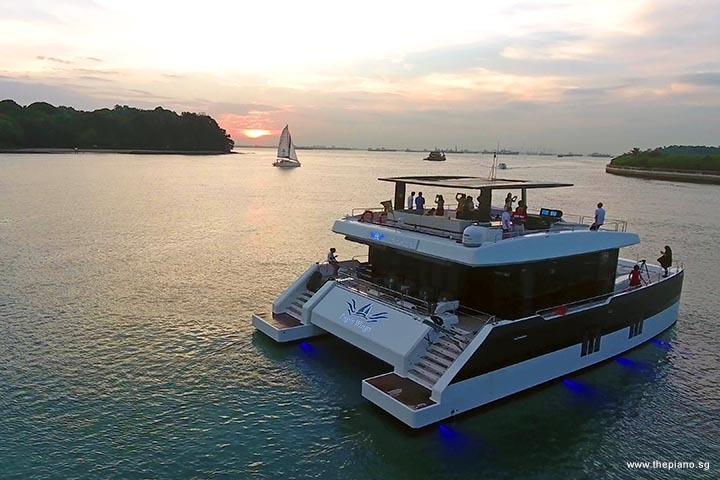 9pm Dock back at Sentosa Cove. 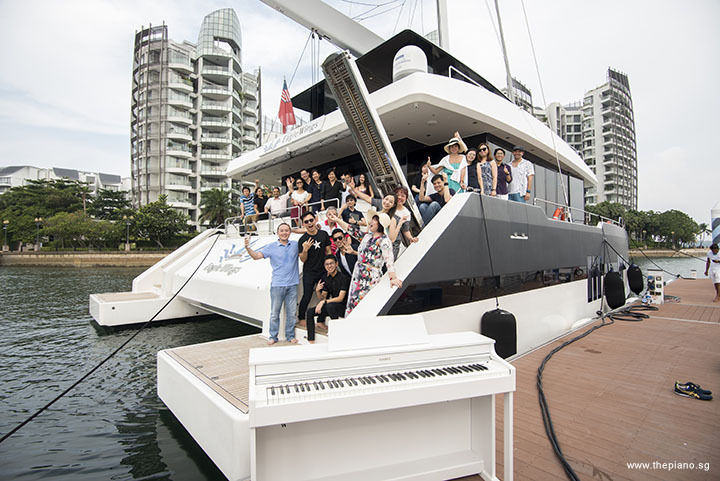 Pianovers Sailaway #2 was attended by piano lovers, local artistes and celebrities, and it was an amazing voyage into the open sea, yet. 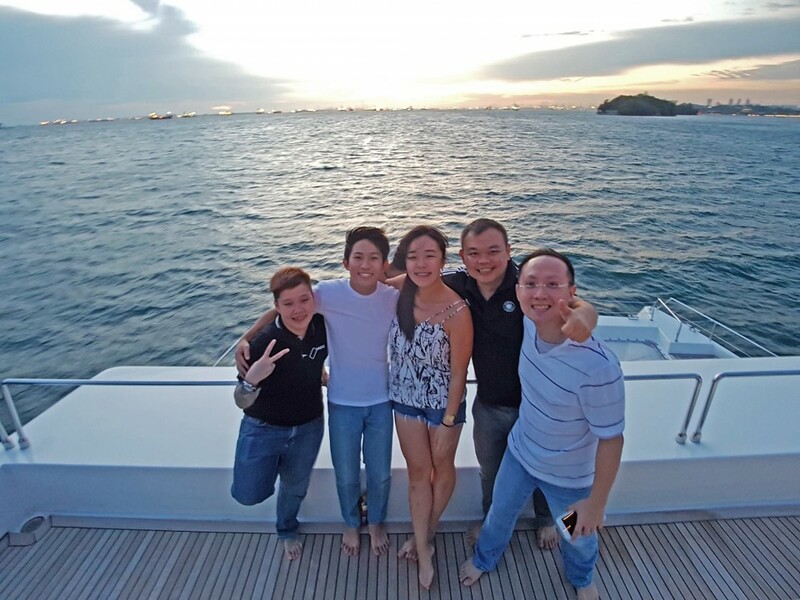 Unforgettable times with friends and everyone. 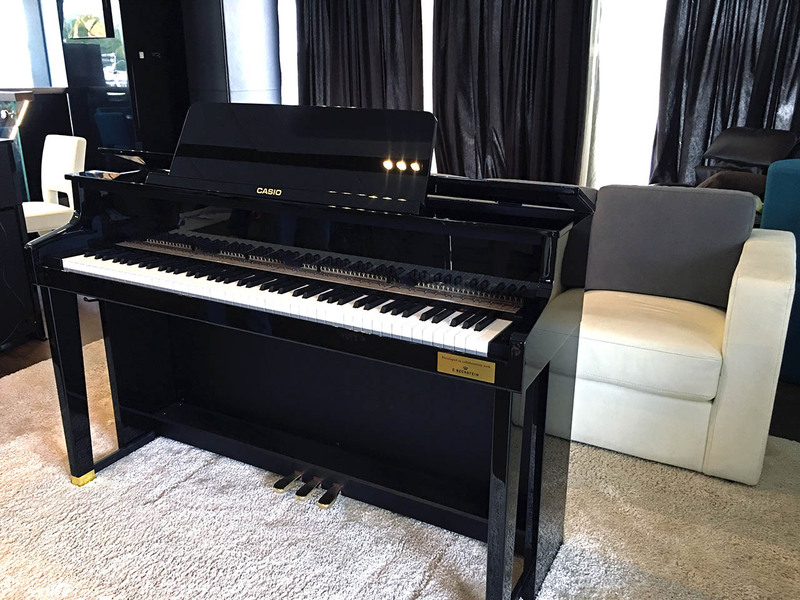 After months of anticipation, Pianovers Sailaway finally arrived! 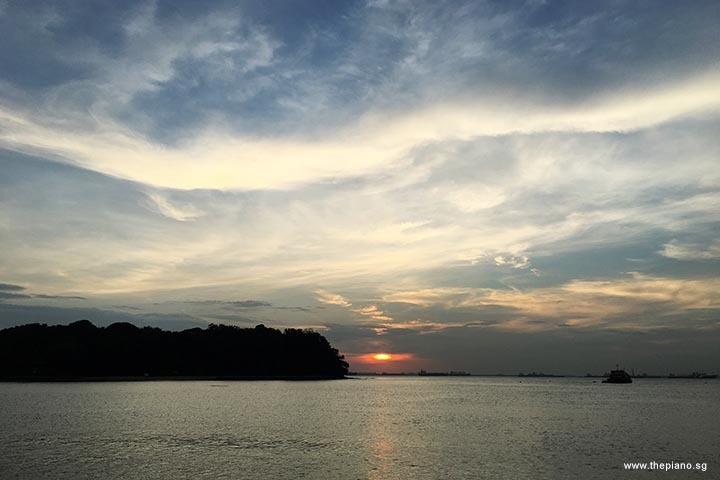 The sky was clear, and the sunset was awesome. 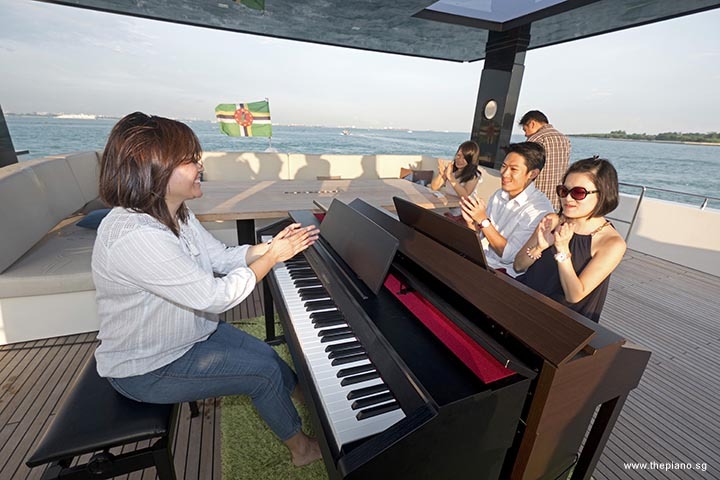 Lots of music was played on the 4 pianos by the amazing Pianovers on board. Priceless moments. 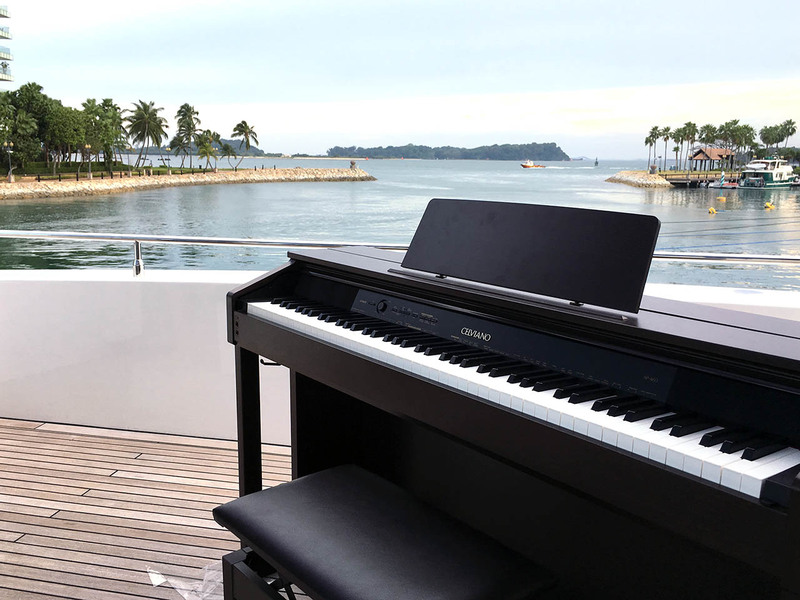 After months of anticipation, ThePiano.SG’s inaugural yacht event, Pianovers Sailaway, finally arrived. 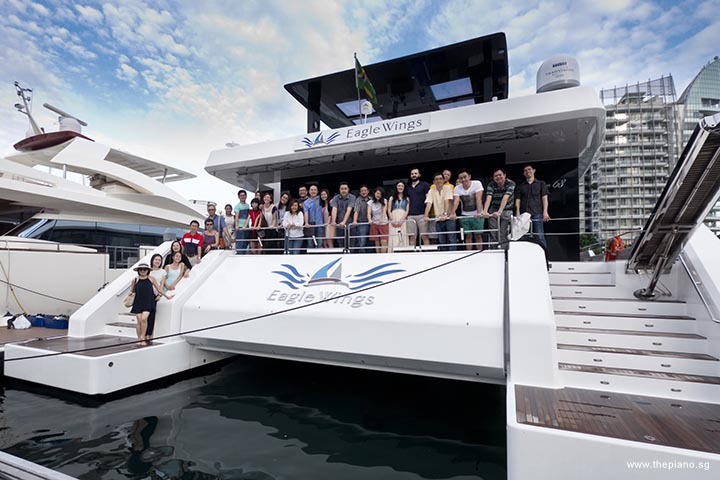 On 4 December 2016, Pianovers, along with support crew, descended upon the ONE°15 Marina Club at Sentosa Cove for the yacht outing that would bring them out into the open sea. What would transpire in the next four hours would turn out to be the event that would become the occasion of a lifetime. 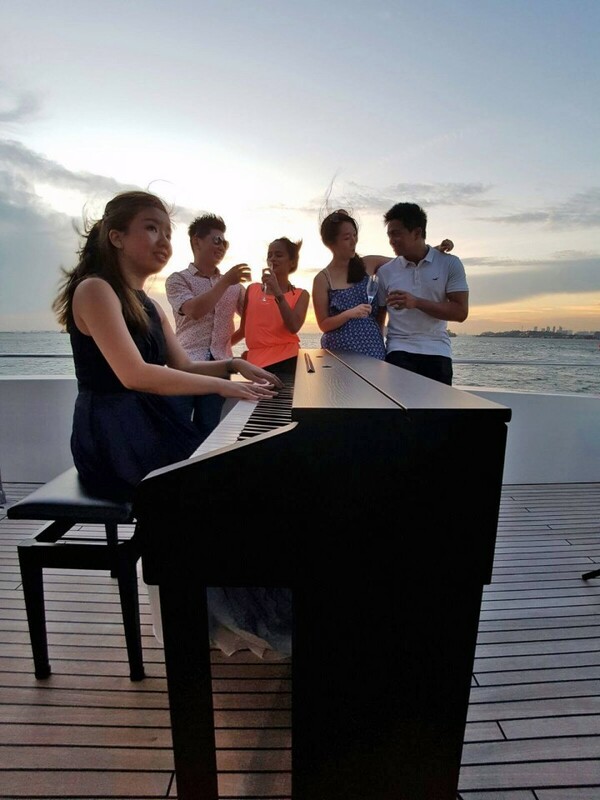 Take a peek at the magical journey that comes with 4 pianos on board a luxurious yacht, complete with buffet dinner, sunset backdrop, drone flying around the yacht capturing aerial shots, fireworks from Sentosa, and of course, the company of like minded piano lovers!